She had just graduated UC Davis and was looking around all the buildings she hadn’t been in much. She was a Landscape Architecture major (didn’t even know you could major in that). My building is for biological sciences, so its understandable that she had probably never set foot in it before. My lab’s building, Briggs Hall, is interesting from an architecture perspective (but maybe not landscape architecture). The building was built in 1971 when there were a lot of campus demonstrations (still are! Pepper Spray Cop was at UC Davis). A method of cutting down on demonstrations was giving students no places to gather indoors. Thus Briggs Hall’s layout is amazing confusing and even I get lost in it after working in the building for several years. Briggs also doesn’t have any staircases inside. All of the stairs are on the exterior of the building. Don’t ask me what lunatic decided that was a good idea for a four story building. Anyways, the recently graduated student asked if there was anything interesting in Briggs. I showed her my lab. She glanced around in it, but not being a biologist she didn’t really understand anything in the lab. I showed her the -80°C (-112°F) freezer which she did like as summer is starting in Davis. I also showed her my favorite part of Briggs, the back exit by the police station. The back exit is where all the old equipment is put that no one wants anymore. These are the pieces that are too big to just throw in the trash. 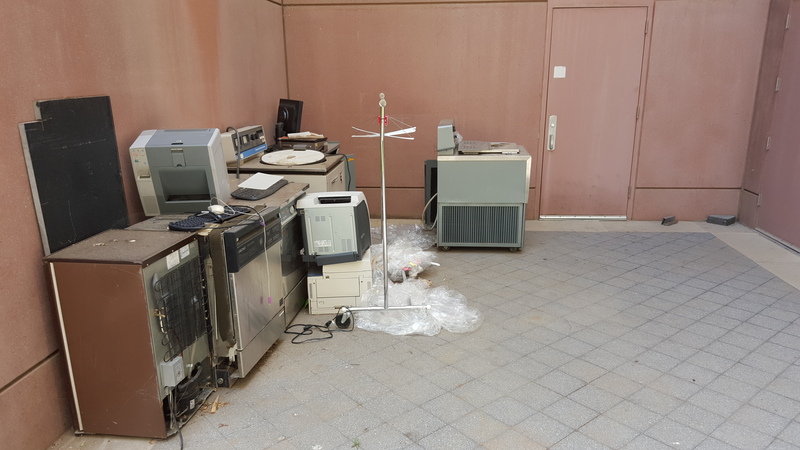 There’s old computers, old centrifuges, old heating blocks, old incubators. Tons of cool science equipment. It’s this sort of industrial wasteland and NO ONE EVER GOES THERE. My lab is super peaceful, but if something ever got too stressful and I needed to go outside, this is where I’d go. Why does industrial junk calm me down? I had an air filter going in my room constantly when I was a kid. That constant hum while I slept made me associate industrial hums and old appliances with peaceful rest. So now places like this always calm me down. Course, the graduated student didn’t get any of that business. Shook her hand and congratulated her on graduating after I showed her the junk pile before going back inside to my lab. My class got to go on a field trip last week. All the joys of barely being able to see the tour guide when you’re at the back of the group. I know! Field trips in a Master’s of Science program? How ridiculous! It was awesome. We went to the Institute of Regenerative Cures in Sacramento. I arrived early and waited out front with some classmates. Our tour guide arrived and we waited out front a little longer til everyone showed up. While waiting the tour guide, who had designed the building we were about to go into, told us about his hobby, early television history! After the primer on early television we entered the building and got a tour of one of the best facilities for practicing biology in existence right now. The brick exterior and columnaic entrance have stayed the same since the building was constructed to maintain the historical site. The interior has been heavily modified. The building had no roof back in the day and was just an enclosure for a bunch of different events that you usually see at state fairs. The building was sold to the University of California system. They slapped a roof on it, and used it to store records. Our tour guide said that he was called in to turn it into a biology facility later on. Half the building is used for bio research while the other half is rented out to other companies. The entrance hallway with pictures of the cooler discoveries at the Institute. The researchers in the Institute are working on a number of things. They researched a treatment for the “bubble boy disease” there. They’re working on using umbilical cords to create bone marrow for transplants, using Tal proteins to treat Huntington’s, creating HIV resistant cells, and helping people who can’t swallow to swallow are just a few of the things they work on there. Where all the research is done! The tour guide also showed us the section that he was most proud of as he had designed it. A set of rooms for making the actual drugs and proteins to export to hospitals. Making the drugs requires extremely sterile technique to prevent giving someone who is already sick something that will make them worse. The rooms are designed to be extremely sterile. To enter the rooms you pass through an airlock where you are required to cover every inch of your body in a disposable gown. The airlock goes to a hallway with access to three separate clean rooms. There is “negative pressure” in the rooms. That means that air is constantly entering the room from the top and going out the bottom. This is so that if any cells that are worked with in the rooms get into the air, they will be redirected to teh ground and sucked out through a grate in the wall instead of ending up in someone’s medicine. The air is cleaned excessively to about 3000 times more clean than average air before entering the facility. There is a lot of electrical equipment in the rooms that will require replacing eventually. To prevent electricians from having to gown up just to replace a lightbulb, all the eletricals are accessible from panels on the second story of the building. It was pretty cool for a scientist like me to see the best possible place to do research in. The tour guide mentioned that he does tours of the interior of the super clean rooms for smaller groups. I might take him up on that at a later time! Woo! Yesterday I had my first day of graduate school and it was amazing! For awhile I’d been worried that I wouldn’t like going back to school once the semester started. All of those worries went away once I stepped out of my car onto campus. I unfortunately arrived late to my first class. I live in Davis and driving to Sacramento has never taken this long in the past. I thought I’d budgeted enough for rush hour traffic. I guessed the time accurately except for the time to leave the freeway. Everyone and their mother wanted to get off the freeway at the Howe Ave exit right by Sacramento State. Next time I go in the morning I’ll get off at an earlier exit and dodge all that traffic. Hopefully that will get me to school with time to spare. Anyways! I got approved to be a TA in a lab course which meets Tuesday mornings. This semester I’m in training, but in the future I’ll be paid. The lab class is a GE fulfilling course, so its filled with students who are not biology majors. The course is also taught by my graduate adviser, which is a huge plus. We’ll get to know more about each through teaching together which will help a lot later in the graduate school process. I assisted the students with a simple discussion lab which tried to define what life is. After the discussion each student took a sterile swabbed and rubbed it on something before rubbing it on a petri dish. Whatever they rubbed onto it will grow over the week and we can take a look at it next Tuesday. When the lab finished I walked around campus. I found the bookstore, the activities fair (no I don’t want to join a fraternity), the student union, and the library. I at my lunch on the quad and then went to read in the library til my next class. I have two other classes on Tuesday. The first was about how to be a better TA. I met the other students and the teacher told us a little bit about herself, her teaching style, and some resources we could use to improve ourselves as teachers. My last class, Molecular Biology, was in the same room as the class on how to be a TA. I was surprised when the teacher walked in because I recognized him! The teacher for my Molecular Biology class is also the post-doc who works in the same worm lab as me at Davis! It was a pretty cool coincidence. Apparently he had already known for awhile, but hadn’t told me yet. I was unfortunately the only person who consistently raised my hand to answer questions in his class. I’m hoping that will change in the future. Maybe everyone else was just shy because they hadn’t met the instructor yet. At the end of the day the instructor and I discussed carpooling together. Turns out that won’t work because he lives in Sacramento and I live in Davis. At the end of the day we want to be in different places. Altogether it was a great day. I loved being back on campus as a student and as a teacher. I love learning and helping other people learn. I’m looking forward to the next two or three years at Sac State! I’ve been thinking about all the things I’m doing with my website and how to balance that with the upcoming responsibility of graduate school. Last year I was employed while my wife went to graduate school for her elementary school teaching credential. At the beginning of September we’ll switch and I’ll be going to graduate school for molecular biology while my wife teaches 5th grade at the neighborhood public school. While I’m not stressed now with work, my day-to-day responsibilities, and all the other things I do for fun, that might change. I saw what my wife went through for her graduate program. Her typical weekday was waking up at 6, leaving at 7:30, and not being done with her classes or her homework until 8PM. If I have to do the same thing… I might not have time to do blog posts every day, stream every week, or improve the website and attached video channels as often. Updates won’t stop, but I expect they will reduce in frequency. I don’t want to make a commitment I can’t keep. I’ve already slipped a little bit on doing updates every weekday. I usually miss a post because I’ve had a long day and don’t have the mental energy to write something worth reading. Typically I make up a missed post on the weekend, but I’m still behind by two posts. I’ll try to make those both up by September, but after that I think I’ll be switching to weekly updates. I hope my schedule will allow me to write posts more often, but I can’t guarantee that until I’ve started my classes and know for sure what my workload will be. Normally I’d post something about D&D on Monday, but this week I’ll be showing off something that came in the mail recently. My first graduate school acceptance letter. 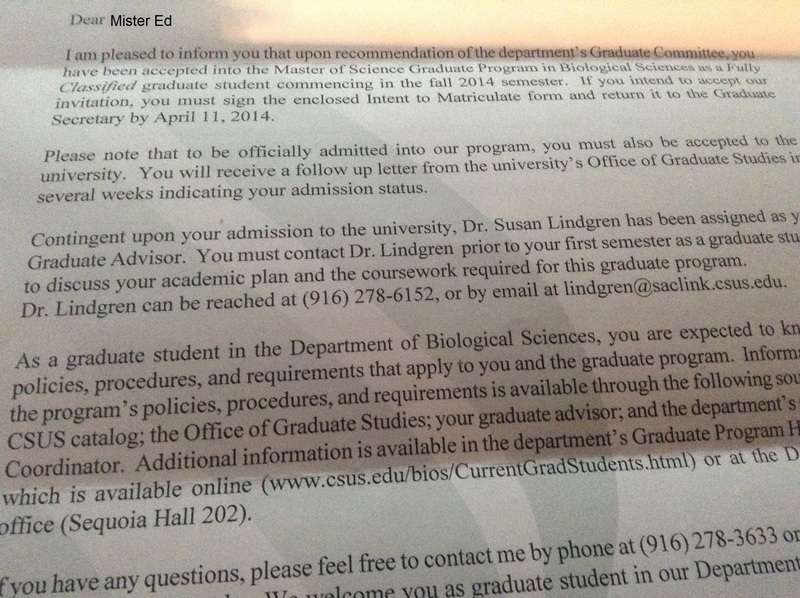 I got into graduate school! Hurray! Validation! This year I only applied to local schools as my wife is in the first year of a two year program for her teaching credential. I applied to two programs at the college I got my undergraduate degree from and a third program at a nearby CSU (Sac State). I’ve been rejected from one of the programs and have yet to hear back from the other one, but Sac State has accepted me! Woohoo! Assuming the other program doesn’t accept me, I will be driving to the capital every day to learn and research science stuff. The professor I’ve been placed with studies salmonella. I haven’t read up a lot on it, but what I saw on the papers she’s published was interesting. Salmonella typically hurt your body in many ways one of which is by attacking your macrophage cells. Macrophages are the part of your immune system that eats bacterial invaders. The salmonella bacteria don’t like being eaten by macrophages though. They protect themselves by putting poisons into your macrophages. The professor has helped discover how this process works and she is attempting to harness the power of salmonella for good, not evil! You see, if salmonella are so good at invading macrophages and killing them, they can also be used to invade macrophages and help them. We can modify salmonella to make it deliver medicine to macrophages. This could do a number of things. It could protect against auto-immune diseases like HIV. It could also super charge the immune system to assist the fight against other bacterial infections. These two things are some of the most sought after effects in medicine right now. HIV is a huge problem throughout the developing world, so the interest in that is obvious. The second effect, of boosting the immune system is even more amazing in my opinion. Bacterial infections such as tuberculosis, STIs, and many others are currently treated with antibiotics. But bacteria can evolve and become immune to these antibiotics. Researchers can come up with new antibiotics, but in a few years the disease will have evolved immunity to it again. But what if you treated the disease just by making the immune system better? The bacteria can still evolve past this, but it takes much longer to do that than to develop antibiotic resistance. Possibly long enough that the disease can be eradicated entirely? That would be astounding. While my original goal was to get entrance into a PhD program, working on making people immune to disease doesn’t sound that bad either. I think I’ll be quite happy at Sac State. This morning I was making a mustard deli meat sandwich. I normally make peanut butter and honey sandwiches where I can put down as much peanut butter as I want and then put it back in the jar. I got really disappointed when I couldn’t put my mustard back in the squeeze bottle. My first and hopefully only reject letter for 2014. Just like I got really disappointed when I got this in my email inbox today. There was a cool tradition at my high school. Everyone took their rejection letters from colleges and taped them to the windows inside the library. When you walked by you’d see all the places other people hadn’t gotten into. I put up three of my own there. A few people put up fake ones as well, rejections form the Pokemon Academy or Hogwarts. I don’t go to high school anymore, but I can still post my rejection letter on a different rejection wall. I had expected this email for awhile, but its still disappointing. Last year they’d replied by mid-January saying I’d get an interview even though their website had crashed and applications only got in on January 10th or so. This year applications got in by December 1st. One of the professors I work with also knows the guy running the application show. She’d talked to him about my application and said it was in the “borderline” pile, meaning they’d choose me for an interview if someone else declined that part of the process. 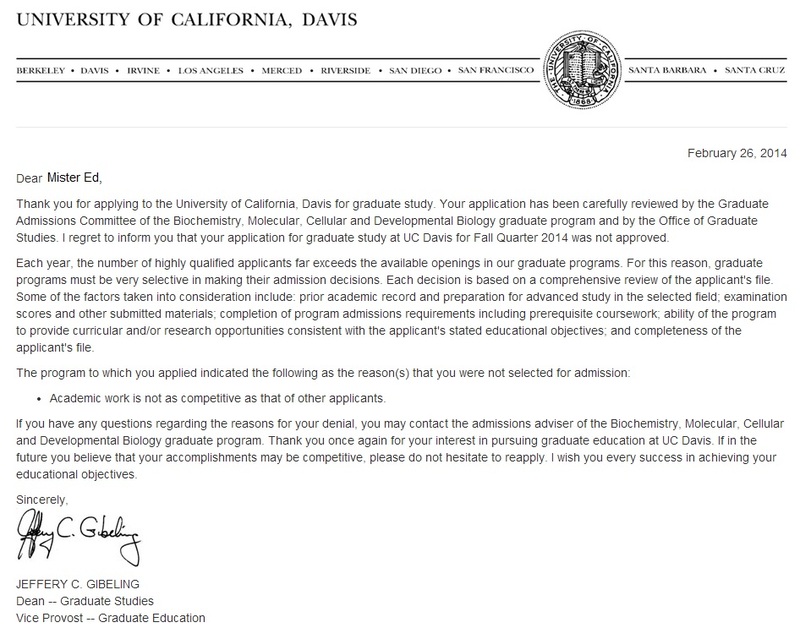 As you can see in the letter, my academic work isn’t as good as the other applicants. I’ve got a 3.5 GPA and made Dean’s list a few times. I used to be a peer adviser at my school, so I got to see the grades of other people applying to grad school in my field. There are people with better grades than me obviously, but not very many. I feel cheated that I didn’t get an interview this year when I got one last year. My professor told me that there were twice as many applicants this year. There was already a record number last year. I imagine many of them are in the same boat as me, rejected last year and reapplying. With that happening I can understand why they’d set aside my application. The school does have limited funding for grad students. I don’t know what their quota is, but they do have one. I’m still sad that I didn’t make the cut. My original plan was to reapply this year and next year as well when my new letters of rec have solid evidence of my research skills. I’ll just stick with that plan and go around the merry-go-round once again. If grad school doesn’t pan out then, there are always other options available.